The California Markets begin June 8th! It is on! We are thankful for the Urban Redevelopment Authority and Brighton Heights Citizen’s Federation with their support and time to make these happen. Now let’s spread the word! The above image is web friendly for downloading and socially sharing with all your friends and family. 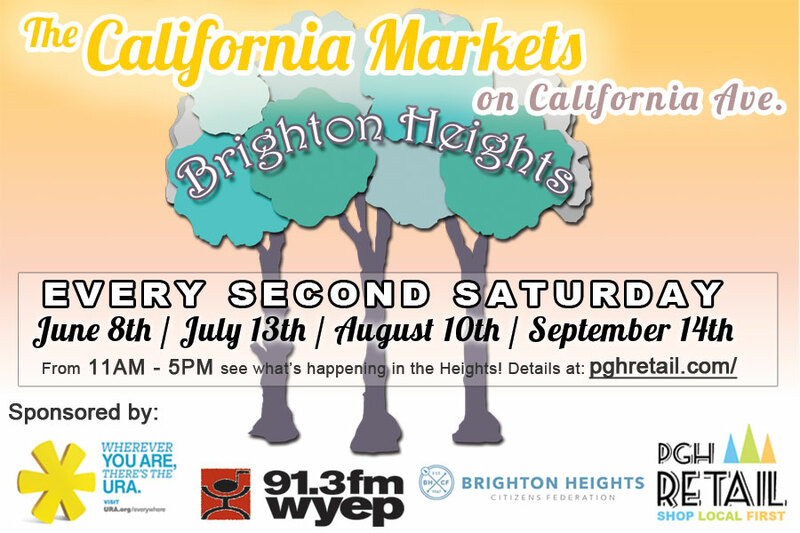 Second Saturday’s this summer will be your new favorite thing with lots to discover in Brighton Heights. Local farmers, food, drinks, crafts, art, and community activities for everyone. Including, raffles for local business prizes, sidewalk art, sidewalk chalk, community garden info, and more! June 8th will be sponsored by the Brighton Heights Citizen’s Federation to wind down their first Local Art Exhibit in their California Ave. offices and new project to bring Creative Crosswalks to the Heights! Also, their Annual Chocolate House Tour is the next day! Sunday, June 9th from 1 – 5pm to walk the historic houses of Brighton Heights, eat some fine sweets, and experience our creative community right in their own homes! You can buy tickets on their website or at our event for $10, while it’s $15 on the day of. Don’t miss out! Interested in helping the markets happen? email pghretail [@] gmail [dot] com to find out how to volunteer. Want to be a vendor? Read more about how on the Become A Vendor page. Information and applications to be apart of the bbq cook-off, home brew-off, drumming tournament, beauty pageant, and fashion show will also be available at the event, as well as, online. There will be ample parking through out the neighborhood and signs posted to where you may find street parking. Termon Ave. and California Ave. past Davis Ave. will be your best bet to grab a spot. NORTH (from Wexford): Take 279 S to Exit 7 for Bellevue/West View. Turn left onto Union Ave/Union Ave Exd. Turn left onto N Starr Ave. Take the 2nd left onto Lincoln Ave. continue onto California Ave. Turn right to stay on California Ave.
SOUTH (from Bethel Park): Take 279 N to the PA RT 65 N exit on the left to US-19/Ohio River Blvd/North Shore. Take exit 1C for U.S. 19/Pennsylvania 65 N toward Ohio River Boulevard, merge, and continue on Ohio River Blvd/RT 65. Slight right onto Brighton Heights Blvd and then turn right on California Ave.
EAST (from Edgewood/Swissvale): Take 376 W to the PA RT 65 N exit on the left to US-19/Ohio River Blvd/North Shore. Take exit 1C for U.S. 19/Pennsylvania 65 N toward Ohio River Boulevard, merge, and continue on Ohio River Blvd/RT 65. Slight right onto Brighton Heights Blvd and then turn right on California Ave.
WEST (from Coraopolis/Sewickly): From the Sewickly Bridge Turn right onto PA-65 S/Ohio River Blvd, turn left on to Brighton Heights Blvd., and then turn right on to California Ave. This entry was posted in Featured, Local Business, News and tagged art show, brighton heights, brighton heights citizens federation, california markets, community, craft show, creative crosswalk, enagement, farmers, farmers market, pgh, pghretail, pittsburgh, summer 2013, ura, urban redevelopment authority, volunteer. Bookmark the permalink.